The XZ400TS series oxygen analyser has proved itself to be a valuable instrument for quality control in cryogenic air separation. A leading European industrial gas company carried out tests with the instrument and it reliably operated at an accuracy of 0.1ppmV using a 10.5ppmV test gas, with the unit displaying exactly 10.5ppmV. Cyrogenic air separation is used to produce high-purity oxygen, nitrogen, Argon and carbon dioxide. Highly accurate oxygen measurements are a crucial part of the quality assurance process. The XZR400 uses Michell’s MSRS zirconium oxide oxygen sensor, which contains a metallic sealed reference and ensures long-term repeatability of measurements as no reference air is required. Unlike electro-chemical sensors, which require regular replacement, the MSRS sensor of the XZR400 should last in excess of 7 years. Calibration is not needed as frequently either (every 3 – 6 months) and can be carried out with just one calibration gas saving time and money. The XZR400 range features three configurations: rack, wall and bench mount. All models include an intuitive touch-screen interface for quick and easy operation, barometric pressure, digital flow meters and a 4-20mA output as standard. 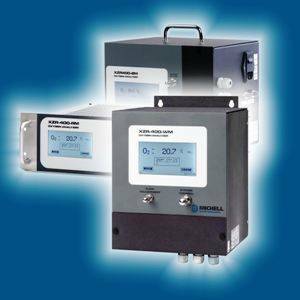 Options include additional outputs such as Modbus RTU over RS485 protocol, RS232 and process pressure correction.